Finally settling on which POS system you’re going to choose can feel like a huge relief. With as many options as there are available, we know the challenges of weighing one against the other. While you may feel like a burden has been lifted off your chest, there are a few mistakes that are commonly made in the selection process that can leave retail business owners feeling regretful and frustrated at the end of the day. Into. If you’re in the process of narrowing down POS software options, welcome to the Visual Retail Plus blog! Today’s post is dedicated to you and the challenging parts of the process that you’re going through. Keep reading to learn about these commonly made mistakes so that you can reduce the chances of making them in the first place. As business owners, shopping around for the perfect POS system will require you to factor in so many things, but the one piece that business owners often forget to consider is their needs. Each business is going to differ in regards to how a POS system can help them out the most, but it’s important to recognize your needs and the needs of your retail store before you go shopping around for a new POS software. POS systems for small businesses will vary in features and in cost, but if you’re saving money and not getting the features that you need to succeed, where do you benefit? If you don’t spend the time to determine what types of features you’re going to need to succeed with this POS system, you could wind up with a software that leads to the failure of your business or, at the very least, a software that creates a huge speed bump for you and your store. It takes money to make money. This is a crucial thing to understand as a business owner. When you focus too much on the price, you begin to sacrifice quality. Your POS system is not one of the areas where quality should be sacrificed. This is something that you’re going to use on a regular basis and is going to be an underlying component of your business and its success. For that reason, it’s crucial that you don’t focus too much on the cost. We understand that budgets are a piece of every decision that is made as a business owner, but it shouldn’t be the only thing that you’re thinking about as you browse your options. It’s when you focus on the cost only that you start to sacrifice the quality of the software, the features that it offers, the support that you have access to, and so much more. Sure — make sure to look for systems that are within means of your budget, but don’t sacrifice quality along the way. 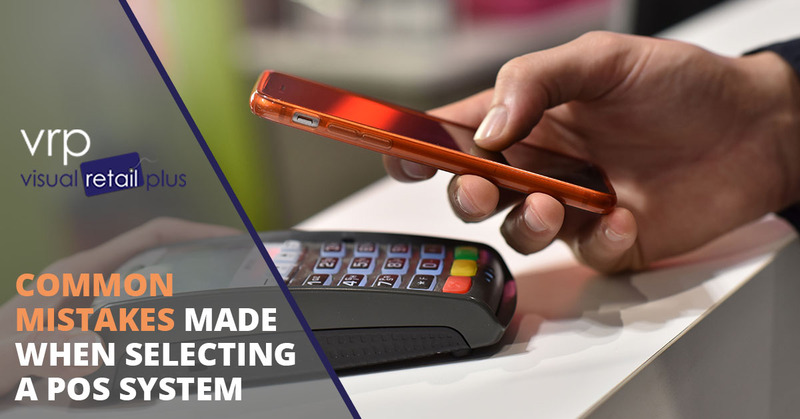 POS systems have evolved so much that each of us has a different idea of what type of hardware a POS system works on. Nowadays, you see so many businesses with iPads and iPhones that it could be easy to assume that the software you choose is going to be accessible on this type of device. Well, we have news for you! One of the most common mistakes that people make when it comes to their POS system is purchasing the hardware too soon. While you may think that a software would be universal enough to run on these types of devices, there’s no way to guarantee it. Before you spend any money on hardware, make sure that you’ve selected a software and know what types of devices it will work on. Purchasing hardware prematurely is just one of the ways that you can waste money in the process of purchasing a software for your business. Would you buy a car that you hadn’t taken for a test drive? What about a house that you’d never had a walkthrough of? In the most relatable of ways, your POS system is similar to a piece of clothing — while you may have a general idea of your size, you never know how it’ll fit until you put it on. POS systems have one underlying purpose and that is to help with transactions. You know, at the end of the day, that whatever software you invest in you’ll be receiving a system that helps with your transactions and inventory. You don’t, however, know how well it will fit into your business model until you’ve seen what it’s capable of. Shopping blindly for POS systems is the next mistake that we’re going to touch on. While it may seem silly to read, it happens more than we’d like to admit! Business owners commit to software systems without ever seeing how the system works or what it looks like. This leaves them disappointed, at times, but it also makes for a ginormous learning curve when it comes time for the software to be utilized. At the very least you should be receiving a video demo of the software before purchasing. Having a professional of the POS software company walk you through the software is even better because you’re able to ask questions and receive some guidance. If the option is available, test out the software and see how it feels and determine from there whether or not it’s something that you’ll be able to utilize regularly. Once you’ve gotten a feel for the software and how you could make the most of it, you can better determine if this software is a good fit, or if you need to move onto the next system on the list. It’s amazing what POS systems are capable of doing. Technology has advanced so much that these software options make it easy for you to enhance your business simply by adding in a high-quality POS system. The thing about becoming successful with the help of your POS system is that you need to fully understand all of the ways that you can benefit from the software that you just invested in. When you skip out on the learning process, you skip out on the opportunities of this software making your life easier. Rather than only utilizing your software for the bare minimum, take the time to learn about this software, all of its abilities, and how you can use it to your benefit. A high-quality software should benefit you in more than one way. Once you’ve discovered how you can enhance your business through the software, share your insights with your team so that they too can make the most of the new technological addition. Most POS providers should offer some sort of support when you sign on utilize the software. Having this support is invaluable! Not only should a support system provide you with answers to your questions when you have them, but they should be able to contribute to the point that we just finished covering: learning. If you’re not entirely sure how you can make the most of the software that you’ve just invested in, ask your support team! Business owners shying away from the support that they have access to is the final point that we’re going to cover in this blog. While it may not seem like a big mistake, it’s shorting yourself of the opportunities that your new technology could provide you — and that’s not what a business owner should do. Take advantage of your support system that’s available! Use them to learn and to grow as a business owner. If you’re not sure how something works, ask! If you’re looking for a way to utilize the software for a certain task, tell them! At the very least they can provide you with some guidance as to how you could move forward from where you’re standing now. Don’t let your business suffer because you’re too scared to ask for help! A huge part of having success with your POS system is choosing the right partner for your business and your needs. Virtual Retail Plus is a POS software for small businesses. Designed by business owners, this software speaks to the needs that so many business owners have. From the ease of use to the high-end support that we offer, our team is there to provide you with the technology that you need to efficiently run your retail business. This POS and inventory management system is unlike the software that you’ve been sifting through, but let us show you how. If you’re interested in seeing how our POS software could benefit your business, reach out to us! We would be more than happy to provide you with a guided demo of how our software works so that you can see firsthand just how much your business would benefit from it. And, while we have you here, make sure to keep up with our blog posts! We truly strive to provide content that business owners will benefit and grow from.